I sometimes go to one of those canteen style carveries at lunch time, the woman serving is beyond miserable and stingy with the portions (I say stingy, the food is always spilling over the plate). They do a great potato gratin with cream which is really rich and delicious, but I know that it’s terribly fattening so often avoid it. There’s an alternative to the cream laden gratin however. This French recipe from Nice uses stock instead of cream and the results are mightly tasty. Depending on what you’re eating it with you can chop and change the type of stock. Or if you’re vegetarian, use vegetable. Slice the potatoes very thinly. 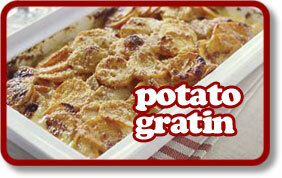 Heat the oil until very hot, pour into a gratin dish then quickly put a layer of potatoes on top. Sprinkle with half the cheese then the onions, then arrange the remaining potatoes nicely if you can be bothered, if not just evenly. Pour over the stock and finish with a sprinkling of the remaning cheese. As a side dish to whatever you like. Great with stews or roasts.